The access to the contents of the http://www.amarques.net implies that the user has read and accepted the following conditions. Users of this website are solely responsible for the consequences, damages or actions their usage of its content may entail, as well as the ones caused by reproducing or disseminating it, including any loss of probable profit. Autocares Marqués S.A. (hereafter "Autocares Marques Mallorca limousines") shall not be liable for potential infringements by users or clients of the website, which may affect the rights of other Autocares Marques Mallorca limousines, website users, clients or third parties including any infringement of copyright, trademarks or patent, confidential information or any other kind of intellectual or industrial property rights. Autocares Marques Mallorca limousines shall not take any responsibility for the accuracy of the information, graphics, links or other data offered in this website.Autocares Marques Mallorca limousines reserves expressly the right to change the information contained in this website without advance notice. Autocares Marques Mallorca limousines commits itself to protect your privacy when you visit the website. In this data protection declaration you will find the regulations used in this website regarding the data collection and dissemination. Autocares Marques Mallorca limousines will only store your personal data if they are voluntarily submitted by you. Personal data are i.e. you name, address, e-mail address, etc. It is also possible to access our website without providing these data. 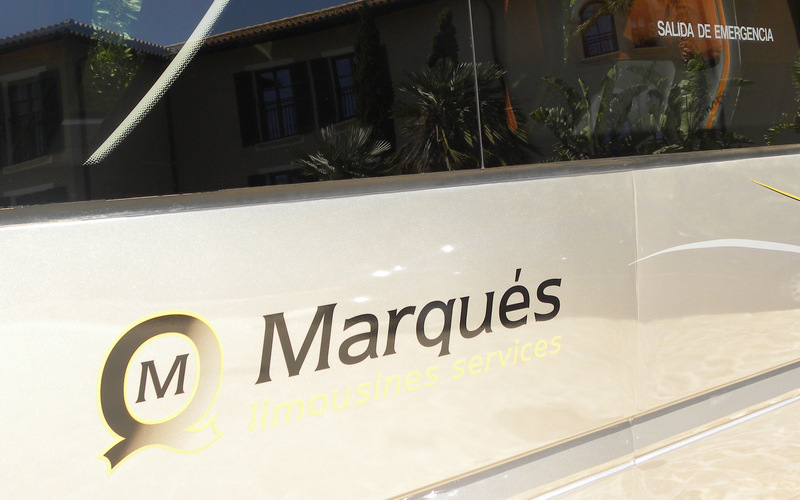 The submitted personal information will be stored, processed with confidentiality and exclusively used by Autocares Marques Mallorca limousines. Some sections of our website may contain cookies. Cookies are data files which are sent through a website to your Explorer and that may be stored on your hard drive. Cookie files can only contain personal data that was submitted by you. They are used by us for the purpose of recognising you when you next visit our website in order to be able to offer you a better service.Autocares Marques Mallorca limousines does not store any personal data through cookie. If you are required to fill in a form in order to get further information, you are submitting us your personal data as your name, your business name, your e-mail address, your telephone number, your address, etc. These data are used by Autocares Marques Mallorca limousines to answer your questions or send you the desired information about our company or products. Autocares Marques Mallorca limousines has taken all appropriate measures for safeguarding the website from unauthorised use, loss or changes of the data which are under our care. Nevertheless, Autocares Marques Mallorca limousines declines all liability stemming from the unauthorised use made by third parties and for the potential loss produced by this use. This website may contain Hyperlinks leading to external websites. Autocares Marques Mallorca limousines does not assume any responsibility for the privacy practices used by those third parties. You are kindly requested to read carefully the Legal notice and the Data protection declaration of our website. Should you not wish Autocares Marques Mallorca limousines to store your data as stated above in our Data protection declaration, we will delete them as soon as you ask us expressly by e-mail to do so. Should you have any questions regarding our Data protection declaration, our procedures or your interaction with our website, we kindly ask you to contact us through the way which you consider the most appropriate. In accordance with the Spanish Organic Law 15/1999 of 13 December on Protection of personal data and the Organic Law 3/2002 on Information–Society Services and e-commerce, Autocares Marques Mallorca limousines informs about the following: 1) the fields marked with (*) have to be compulsory filled in, in order to be registered as website user. 2) the submitted personal data will be added to an automated register whose solely responsibility is borne by Autocares Marqués S.A. (CIF: A07274814, with registered address in Carrer del Gremi de Boneters, 47 07009 Palma de Mallorca Illes Balears España, The only purpose is the supply of information and the offer of products and / or services, adapting them to your interests or needs. The dispatch can either be by post or e-mail. Should you not desire to receive commercial information, please free in the register form the corresponding fields from marks. Your data will be processed confidentially and will not be ceded or disclosed to any other entity or individual. To exercise your right regarding access, correction, cancelation and objection, please send a letter to Autocares Marqués S.A. (CIF: A07274814), to the above specified address, enclosing a photocopy of your ID card or a similar document.